← Are Marijuana Stocks Good Investments? First Alerted By AimHighProfits on September 24, TagLikeMe Corp. (PINK:TAGG), operators of TagLikeMe.com, an Internet services platform that combines the most commonly used functions of search and social media interaction, hit all time highs on Friday leading the OTC listed stocks in trades, second in volume. 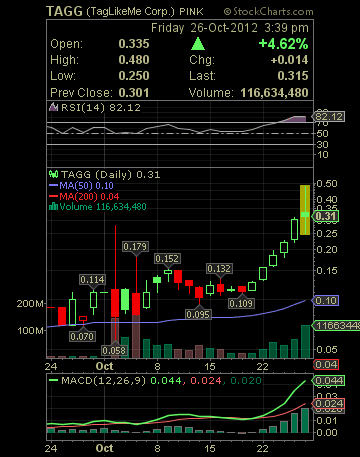 In anticipation of a possible bull run, AimHighProfits initiated coverage on TAGG stock on September 24, 2012 in article titled: TAGG | Plenty To Like About TagLikeMe Corp.’s Stock. TAGG shares are currently trading at 0.315, down -0.1799 (-34.36%) from their intraday high of $0.4799.